This is Libby (and I'm not sure if I've spelled that correctly, she's not mine). 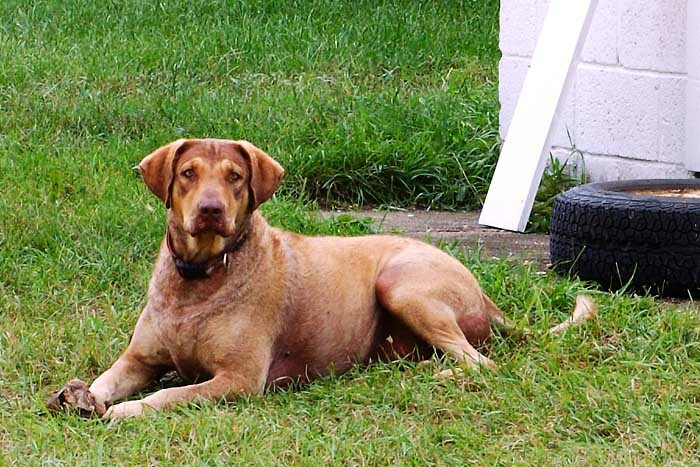 Libby is a Chesapeake Bay Retriever and a newly arrived resident of Michigan. She's very friendly, very playful and has what seems to be a wonderful temperament. She also spent two days riding with my son, Josh, his friend Eric and three 6-month old kittens as they returned from Florida. One 100 pound dog, 3 kittens and two unwashed young men ... whoohoo!